LENNY CASTRO is one of the world's most in-demand percussionists, and he has done his part to inject percussion into rock and pop music. "I've always been into the Latin feel, because of my heritage. But I was the only kid on the block that was listening to Hendrix, classical, country and western," he says. "Percussion can go in almost any kind of music. You have to be open-minded enough to try it." Castro was first influenced by Armando Peraza, Mongo Santamaria, Willie Bobo, the Rascals and the Beatles. He learned by playing and watching others play at parks and beaches in New York. 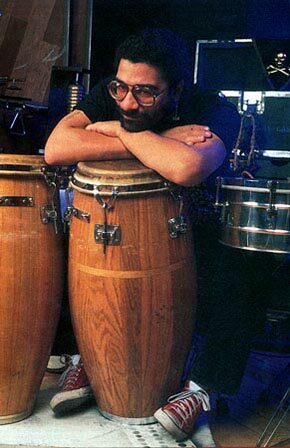 At the age of 15, Lenny began playing LP fiberglass congas. "Now, I gotta have wood, and I gotta have skin," he laughs. "And the stuff that LP makes is phenomenal." Lenny has performed recently with Little Feat, Boney James, Peter White, and on the Francis Ford Coppola film Rainmaker with Charlie Watts, Taj Mahal, and Billy Preston. On Joe Sample Trio's Sample, he plays a kit that is part drum set and part percussion. "It's really different, almost like having a second career," he laughs.